Well, Tuberculosis is a communicable disease that is usually caused by bacteria. 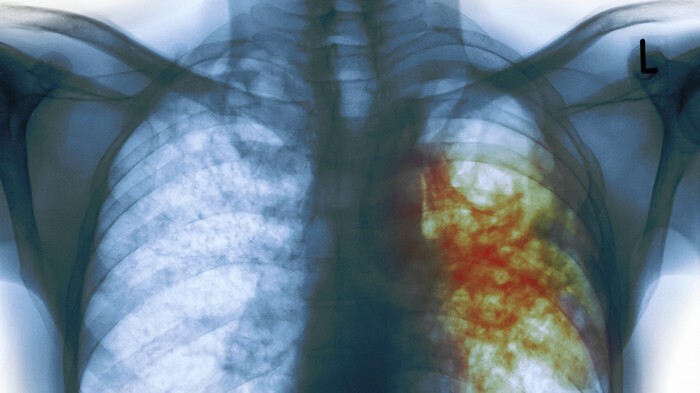 Tuberculosis generally affects the lungs, but can also affect other parts of the body. Most infections do not have symptoms, known as latent tuberculosis. About 10% of latent infections progress to active disease which, if left untreated, kills about half of those infected. The usual symptoms of active tuberculosis are a chronic cough with blood-containing sputum, fever, night sweats, and weight loss. The historical term "consumption" came about due to the weight loss. Infection of other organs can cause a wide range of symptoms. Tuberculosis is spread through the air when people who have active tuberculosis in their lungs cough, spit, speak, or sneeze. People with latent tuberculosis do not spread the disease. Active infection occurs more often in people with HIV/AIDS and in those who smoke. Diagnosis of active tuberculosis is based on chest X-rays, as well as microscopic examinations and culture of body fluids. Diagnosis of latent tuberculosis relies on the tuberculin skin test (TST) or blood tests. 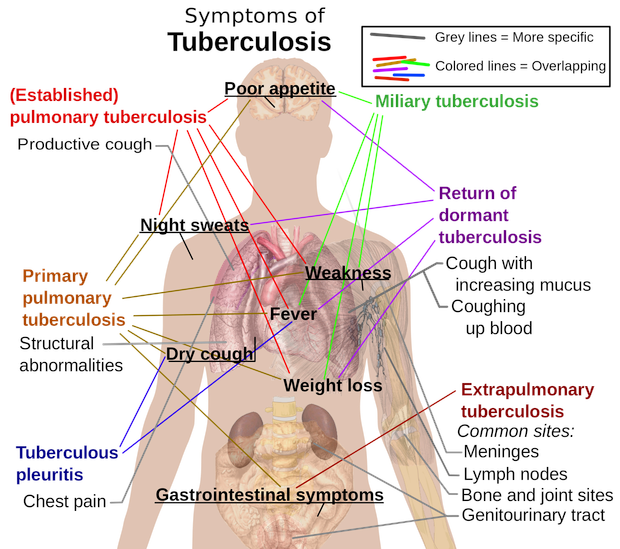 Tuberculosis may infect any part of the body, but most commonly occurs in the lungs (known as pulmonary tuberculosis). Extrapulmonary tuberculosis occurs when tuberculosis develops outside of the lungs, although extrapulmonary tuberculosis may coexist with pulmonary tuberculosis. 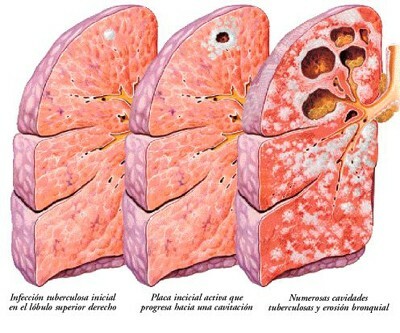 This is what the lungs will look like over the time period of a person who had tuberculosis. This is what the bacteria in your lungs looks like. This is an X-ray of a person who had tuberculosis. The main cause of tuberculosis is Mycobacterium tuberculosis, a small, aerobic, nonmotile bacillus. The high lipid content of this pathogen accounts for many of its unique clinical characteristics. It divides every 16 to 20 hours, which is an extremely slow rate compared with other bacteria, which usually divide in less than an hour. Mycobacteria have an outer membrane lipid bilayer. If a Gram stain is performed, MTB either stains very weakly "Gram-positive" or does not retain dye as a result of the high lipid and mycolic acid content of its cell wall. MTB can withstand weak disinfectants and survive in a dry state for weeks. 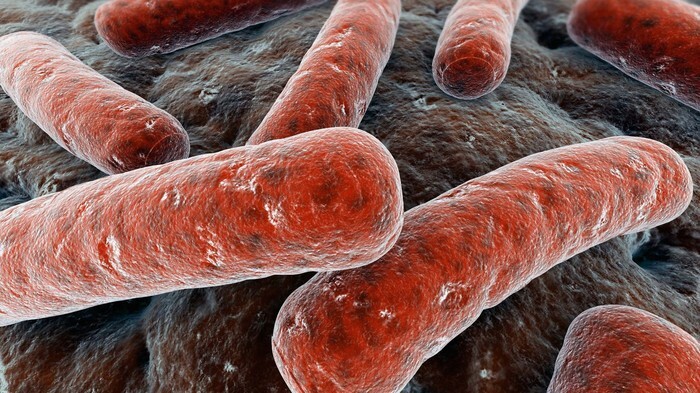 In nature, the bacterium can grow only within the cells of a host organism, but M. tuberculosis can be cultured in the laboratory. Prevention of tuberculosis involves eliminating those at high risk, early detection and treatment of cases, and vaccination with the bacillus Calmette-Guérin vaccine. Those at high risk include household, workplace, and social contacts of people with active tuberculosis. Treatment requires the use of multiple antibiotics over a long period of time. Antibiotic resistance is a growing problem with increasing rates of multiple drug-resistant tuberculosis (MDR-TB).